Fish is the healthiest protein on the earth. Thanks to Omega-3s in fish that reduces heart disease, risk of strokes and contribute to brain health. There are many ways in which you can cook the fish. You can fry, grill, bake and steam the fish. You can also make curry, kabab or many other things with fish. This is a delicious kabab recipe that is great to serve in winter with tea or as side dish in a dinner. Add fish, onion, ginger, garlic paste, coriander powder. cumin powder, red chili powder, turmeric, salt, carom seed and 2 cups water. Cook until fish get soft and dried. Let it cool. Now mash the potatoes and eggs. Mix potato, eggs, coriander leaves and garam masala powder in fish and mix all together. 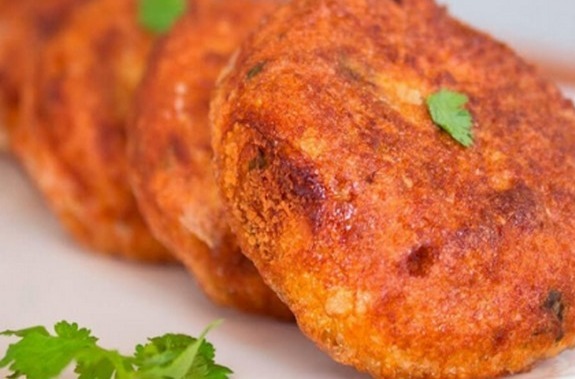 Make small round shape kabab. Dip in egg and fry in hot oil until golden from both sides about 5 minutes.